A rare cancelled session this morning meant that I had some time to spare. Instead of running around the house and tidying up, I did 30 minutes of yoga. And I feel so much better for it! Which made me realise - we need to stop thinking of doing things for ourselves as a treat or a luxury. 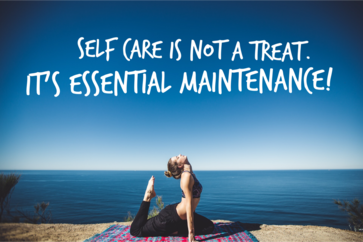 Self care is ESSENTIAL. If we don't make time for ourselves, no one is going to give it to us. 30 minutes out of your day for a walk, run, bit of yoga, cup of tea, some meditation, can make all the difference. We need to stop thinking that having our hair done or having a massage is a treat - it is ESSENTIAL MAINTENANCE. Just think how much better you feel afterwards - how can that not be essential? We are more likely to put things that we see as 'treats' to the bottom of the list of things to do - so view them as essential and you will be less likely to put them off. So go on - make time for some essential maintenance today.